Leaders of Africa’s Internet community have unveiled a comprehensive plan designed to dramatically increase African involvement in the Internet Corporation for Assigned Names & Numbers’ (ICANN ) multi-stakeholder model. Leaders of Africa’s Internet community have unveiled a comprehensive plan designed to dramatically increase African involvement in ICANN’s multi-stakeholder model. 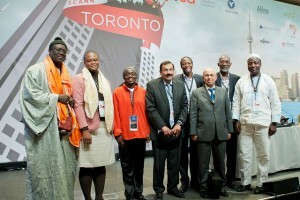 The initiative was presented to ICANN during the organization’s 45th public meeting in Toronto, Canada by the Africa Strategy Working Group (ASWG). It was formed after ICANN’s new President and Chief Executive Officer, Fadi Chehadé encouraged a stronger voice from the African continent in ICANN’s multi-stakeholder model. “When we met three months ago at the ICANN meeting in Prague, I felt a sense of frustration at our inability to come together and move the Africa agenda forward,” said Chehadé. “It’s incredible what this working group has achieved in such a short period of time by engaging with many concerned groups and individuals through the multi-stakeholder process. “We employed a bottom-up, open and public process in developing this initiative,” said Nii Quaynor of Ghana, a well-respected Internet leader in Africa and Chair of the ASWG. The plan was written with the input and broad support of ICANN’s African community, Africa’s Regional Registry for Internet Number Resources (AFRINIC) and other influential African organizations involved in the Internet ecosystem. The three year initiative, entitled ICANN’s New Approach to Africa, lays out clear goals and milestones and an action plan for the first 12 months. It is a collaborative effort by AFRINIC, Africa’s Regional Registry for Internet Number Resources and the ICANN community. The initiative will now be posted for public comment. Currently, African internet users represent only 6 per cent of Internet users worldwide. This initiative is designed to dramatically increase that number. Click here to review the presentation of ICANN’s New Approach to Africa.